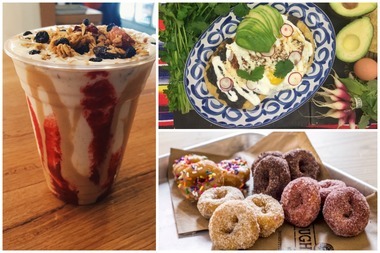 The brunch offerings will include Chelsea Creamline's peanut butter and jelly shake, left, Bodega Negra's huevos rancheros, top right, and an array of options from Chelsea Market's Doughnuttery, bottom right. MEATPACKING DISTRICT — The Meatpacking District's hottest restaurants are engaging in a "Battle of the Breakfasts" to determine where the best brunch can be found in a neighborhood long known for its nightlife. The Feb. 29 event is organized by the local business improvement district to encourage people to spend the day partaking of its array of unique shopping options, the newly relocated Whitney Museum and the myriad restaurants offering brunch. "It's not that people didn't know that you could eat in the Meatpacking District," said Lauren Danziger, executive director of the local business improvement district. But the event aims to show "that you could eat here anytime and it's not just about nightlife — though we are very proud of our nightlife," she added. Restaurants throwing their hats in the ring include Bubby's, Colicchio & Sons, Bagatelle, STK, Bodega Negra, Tao, Dos Caminos, Chelsea Creamline, Serafina, and the Whitney Museum eatery Untitled. Other highly-anticipated treats include brioche with maple syrup and bourbon butter, lobster macaroni and cheese from Bagatelle, and the huevos rancheros from Bodega Negra. The food will be complemented by creative takes on classic brunch cocktails, sponsored by Belvedere and Chandon. Possible drinks include a Chandon rosé mimosa, she said, and a King Crab bellini. Danziger said the idea behind the contest was to "celebrate [the food scene] in a meaningful way that had a different type of interaction." The event will be held at 451-459 West 14th St. from 6:30 p.m. to 9 p.m. Tickets range from $55 to $75, and can be purchased online. A full list of the participating restaurants is available on the BID's website.